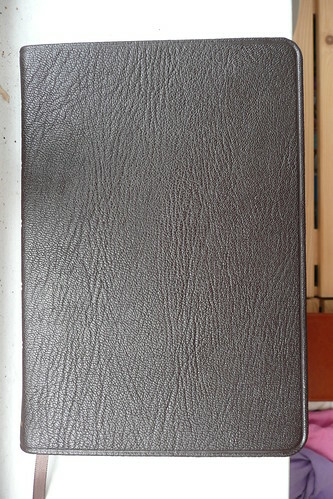 David Dewey will be reviewing the new Cambridge Pitt Minion ESV for The Baptist Times, but we're fortunate to have a sneak preview today, including photos of the brown goatskin and imitation leather editions. DAVID'S FIRST IMPRESSIONS: "First impressions are that Cambridge has done a first-rate job. First some general comments, then something about each edition. I won't comment on the translation, except to note it is the 2007 edition with American spellings. "The Bibles open flat straight out of the box. 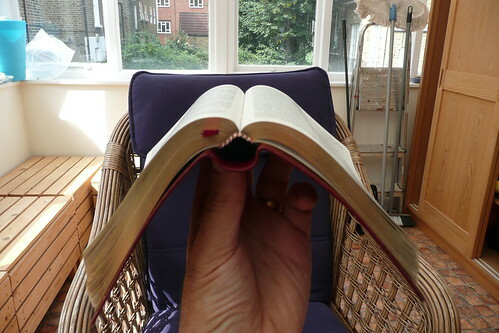 The bindings are limp, but not floppy; but with such a lightweight Bible, floppy is of little advantage. Both are stitched (Smyth sewn). "The text is wonderfully clear; there is a little see-through, but no more than you would expect with thin India paper. The centre column for the cross references is a little wider than I would have anticipated but considerably more attractively organised than Crossway's. 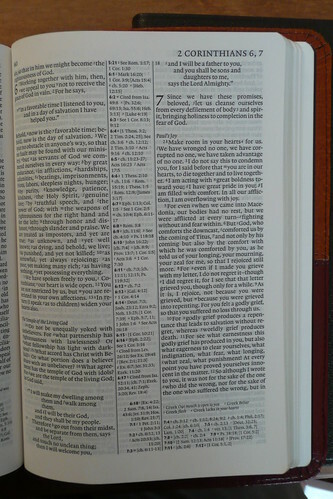 The references are indexed by chapter and verse number in bold type. I was worried that with my ageing eyesight, the cross-references would be a problem, but they are the model of clarity. "Both editions I have (thankfully) are black letter, so I cannot comment on the appearance of the red letter. All other Cambridge Pitt Minions offer red letter only, so at least with the ESV there is a choice. "There is one presentation page, a list of book abbreviations, the ESV preface and explanation of features. There are no book introductions. 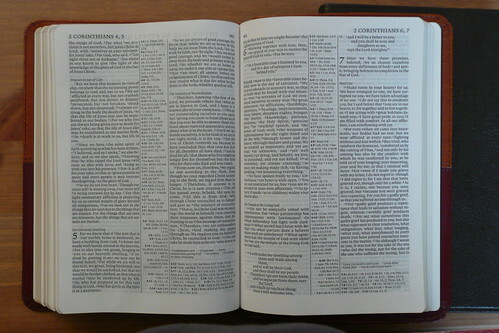 "The concordance has 5,900 references in two columns, the same, it would appear as in the newer Crossway deluxe compact editions. 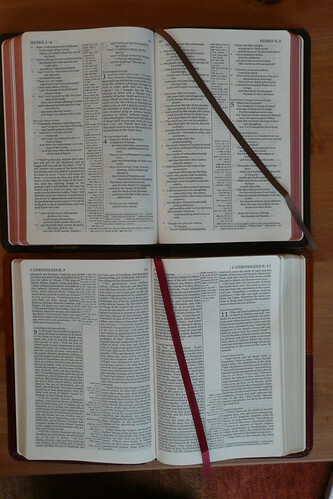 I would prefer more references (thinlines have 12k, others 14k) , but keeping the Bible thin (21 mm) has been a goal. "There are 15 pages of maps (indexed); the colour is neither too garish nor washed out. 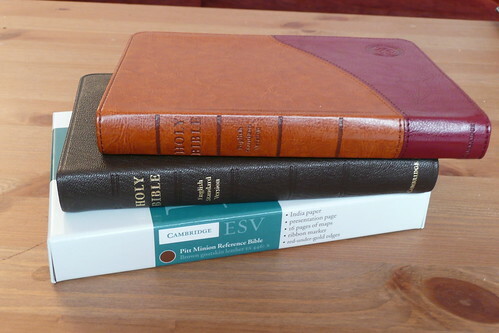 "Both Bibles came boxed in the newer style Cambridge boxes.that open in booklike fashion. 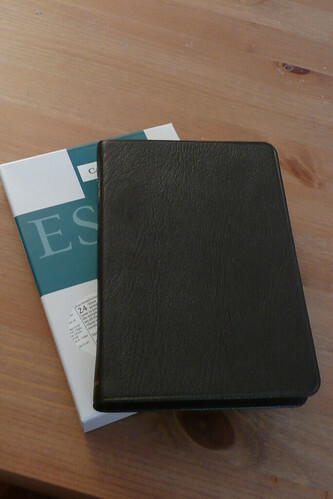 For the ESV boxes Cambridge uses a greenish-turquoise on an off-white background." "The brown is quite dark (almost to the point of being slightly dull in indoor lighting; it looks better under natural light). It is warm without being orangey. 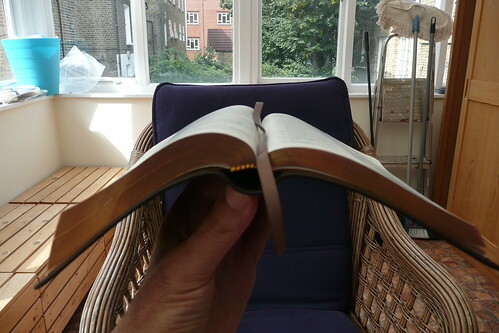 The distinctive grain has just the right depth coarserness for the size of Bible. There is a single ribbon in a slightly lighter brown. The lining is also a dark brown. "The goatskins have art gilt edges (gold over red); the others mere gilt. "There is an embossed edge round the cover, but no gold lining. The only wording is down the spine: 'HOLY BIBLE'; 'English Standard Version' and (at the bottom) 'Cambridge'. 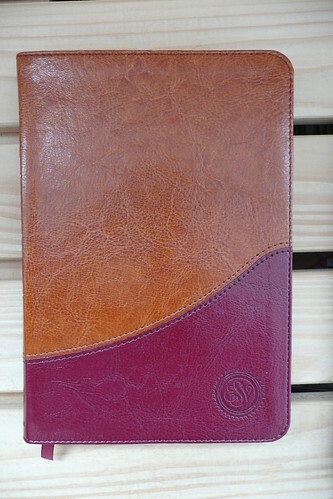 The words 'goatskin leather' appear on the bottom of the inside front cover. The spine has bands (for appearance only), though it looks as though there should be one more at the bottom and just above the word 'Cambridge'." "A raised edge, extending nearly half an inch, can be felt all round the ratehr thinnish cover where the edge is folded over. My Crossway Personal Size Reference Edition has the same problem. That said, I think I almost prefer the faux leather to the goatskin. That maybe because I like my Bibles in brighter colours. The faux leather opens just as flat as the goatskin and even feels slightly more flexible. However, the goatskin will probably soften with use; the faux leather won't. And which will last longer? Who knows? "With two, I can use the faux leather as an everyday Bible to carry around; the goatskin can be kept for desk use and preaching." Lets offer a big thanks to David for sharing this first look at a much-anticipated new edition. I'm looking forward to getting my hands on these and doing a complete review. In the meantime, enjoy the photos!